Speed’s Bike Shop is a family run business that offers full and friendly service! 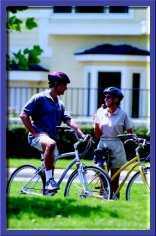 We have Specialized bicycles available for rent. All of our rentals are well maintained. Come and enjoy the trails with us! Links to bike trails throughout Wisconsin, bike trail maps, other online bike trail maps, bike clubs, tours and more! This trail is a connecting link between the Elroy-Sparta State Trail and the Great River State Trail. Learn all about nearby Sparta, Wisconsin, the "Bicycling Capital of America"
Local Bed & Breakfast Resort near the Elroy-Sparta Bike Trail with rooms, cabins and 200 acres of things to do! Elroy, Wisconsin "Where the trails meet"
Information about Sparta's annual festival held the 2nd week of June. More bike trail information and things to do in surrounding Monroe County.